Tribal Fusion developed out of a lineage of innovative dancers and teachers. In the late 60’s in San Francisco, bellydancer, Jamila Salimpour, developed a ‘tribal style’/aesthetic to her dance performance with her company, Bal Anat. In order to tailor belly dance performances to suit the styling’s of the California Renaissance fairs of the time, Jamila drew from the tribal dances and costuming of North Africa and the Eastern Mediterranean. Later, one of Jamila’s students, Masha Archer, furthered the fusion of the design and costuming inspired by middle eastern and north African tribes and also began to include non-middle eastern music and movement styles in her teaching and through her San Francisco Classic Dance Troupe. Later still, one of Masha’s students, Caroleena Nericcio, went on to develop styling further and developed an original dance form – American Tribal Style (ATS) – a group improvisation style with set cues and movements that are improvised live on stage. Caroleena Nericcio created Fat Chance Belly Dance company – so called based on when she would tell men she was a belly dancer and they would ask for a private dance, she would respond “fat chance!” The impact on costuming style was to bring in more textile costuming, elaborate jewelry, tattoos, body paint, hair pieces, long, flowing skirts (reminiscent of the types of skirts worn by Flamenco dancers and certain Gypsy cultures), choli, coin bra, and tassel belt. Pantaloons, hip scarves, and turbans were also incorporated. This type of costuming was very different from the sequined costume traditionally associated with belly dance. After the tribal styling developed, along came the fusion. A long time member of FCBD, Jill Parker formed Ultra Gypsy Dance Theatre Company in 1996 and expanded the ATS vocabulary to include other dance styles (including burlesque, cabaret, flamenco, amongst others) in order to personalize the form and create unique fusions. Some of today’s big names in Tribal Fusion were in Ultra Gypsy, including Rachel Brice and Sharon Kihara to name but two. Rachel Brice (currently one of the world’s most famous tribal fusion bell dancers) was also a student of Suhaila Salimpour (Jamilla’s daughter) and blazes the trail for Tribal Fusion today, training bellydancers world wide in her 8 Elements training scheme, live in workshops at festivals across the world and via her online training portal Datura Online. By the early 00s, Tribal Fusion’s lineage had been passed on and developed by generations of students to the point where the name becomes more of an umbrella term used to encompass a plethora of fusion styles – urban fusion, dark fusion, contemporary fusion, cabaret fusion, goth fusion, etc etc. Increasingly, Tribal Fusion dancers are drawing from contemporary dance – both theoretically and in form. In many ways this is a difficult combination to truly fuse as the forms are so different – for example belly dance tends to be relatively static in space, upright and concerned with intricate articulation in the torso, while contemporary dance includes inversions, floor work, use of space and often is concerned with meaning/concept. 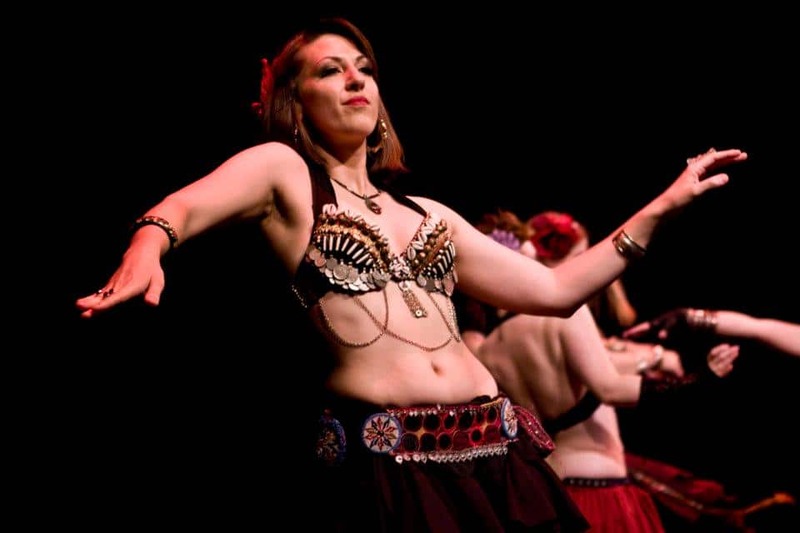 Elise started studying Tribal Fusion with Hilde Cannoodt in 2009 and has performed multiple times in her Masmoudi and student troupes, as well as performing solos at haflas and festivals. Elise has also studied with: Mira Betz, , Amy Sigil (Unmata), Tjarda (Hip Sick Unusual Theatre), Samantha Emanuel, Donna Mejia, Mardi Love, Olivia Kissell, Anasma, Susan Frankovitch, Ela Rogers and Charlotte Wassell. Elise’s fusion practice is strongly informed by her training at Laban Conservatoire of Dance, London, where she completed by Postgraduate Diploma Community Dance. She enjoys playing with the flow of energy within the body and in space as well as with contrasting speeds/qualities of movements. Elise draws strongly from her choreographic education and how to work with concept to create and develop movement, as well as her knowledge of Rudolf Laban’s studies of the mechanics of movement that helps demystify making dance, turning it into a problem solving game. As a teacher and community dance artist, Elise is most interested in body-mind centering and authentic movement approaches to teaching. These are about helping individuals listen to their own bodies as a starting place for moving and drawing out people’s personal dances, working them into a group experience or production. Building a sense of connectedness and community is essential to Elise’s practice as it helps us build and develop our own dances as well as the dance forms we learn and contribute to.